Reserve your tickets NOW! This event has been a sell-out for years! 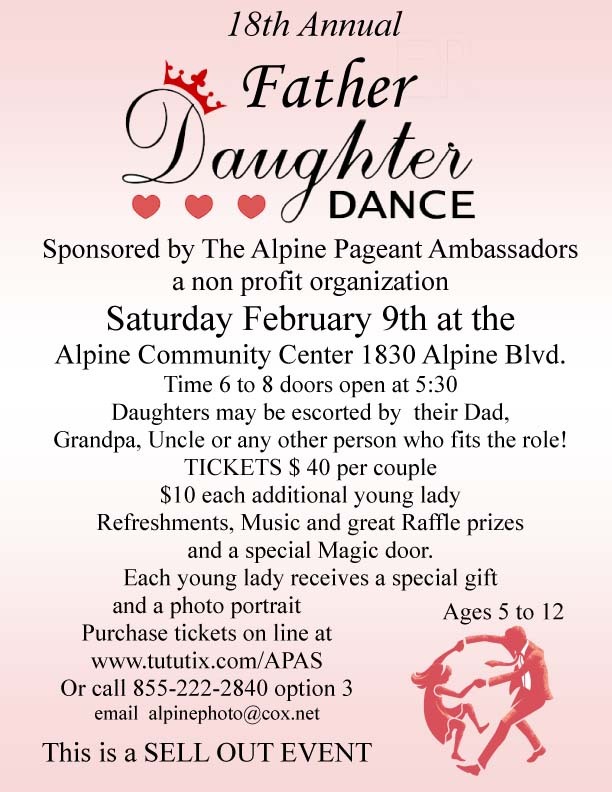 Alpine Pageant Ambassadors proudly presents the 18th Annual Father Daughter Sweetheart Dance on Saturday, February 9, 2019 at the Alpine Community Center ( 1830 Alpine Blvd, Alpine, CA 91901 ) from 6pm to 8pm. (Doors open at 5:30) Daughters ages 5-12 may be escorted by their Dad, Grandpa, Uncle or any other person who fits the role! Refreshments, Music and great Raffle prizes and a special Magic door. Don’t miss the “Social Event of the Year”! First come, first served! Reserve your tickets now: This event has been a sell-out for years! Limited to 150 couples! 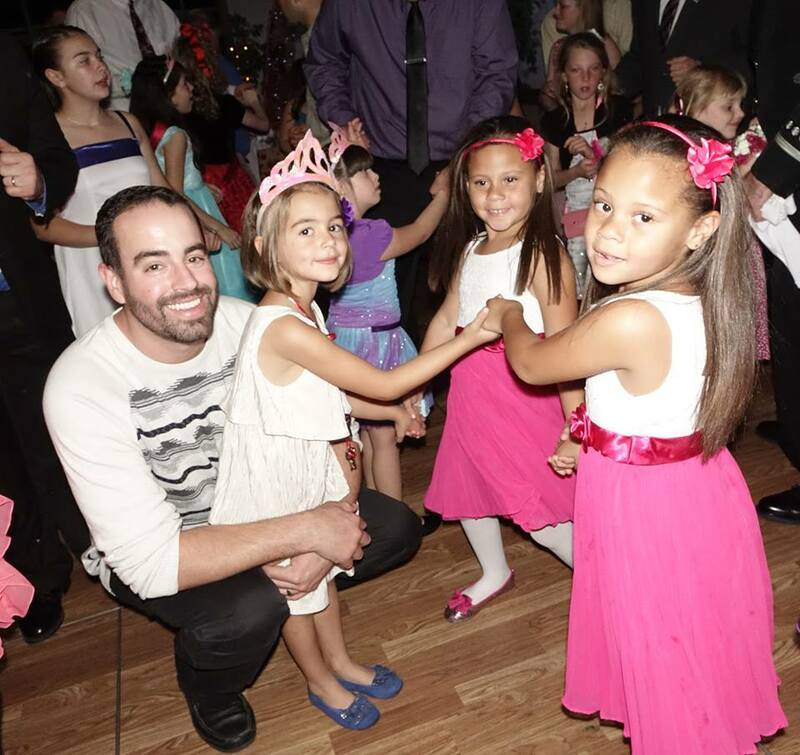 Each young lady receives a special gift and a photo portrait! 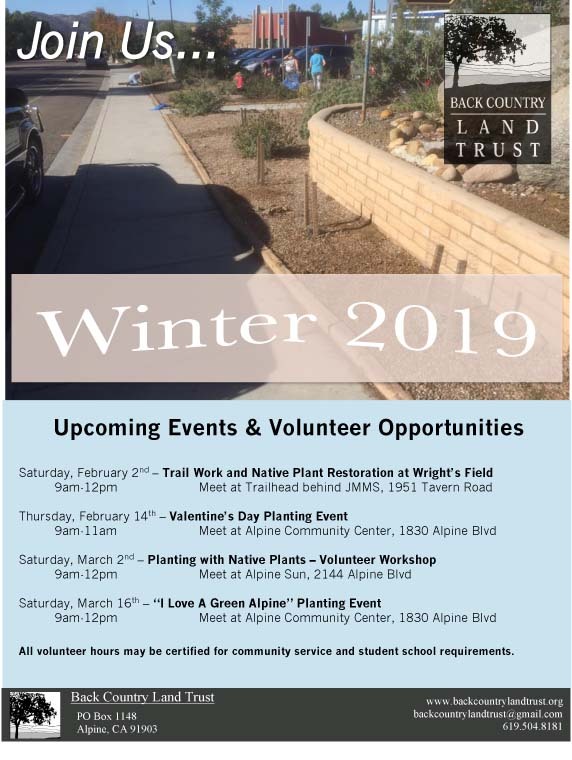 Join the BCLT (Back Country Land Trust) on Saturday, March 16, 2019 for the “I Love A Green Alpine” Planting Event 9am-12pm Meet at Alpine Community Center, 1830 Alpine Blvd. 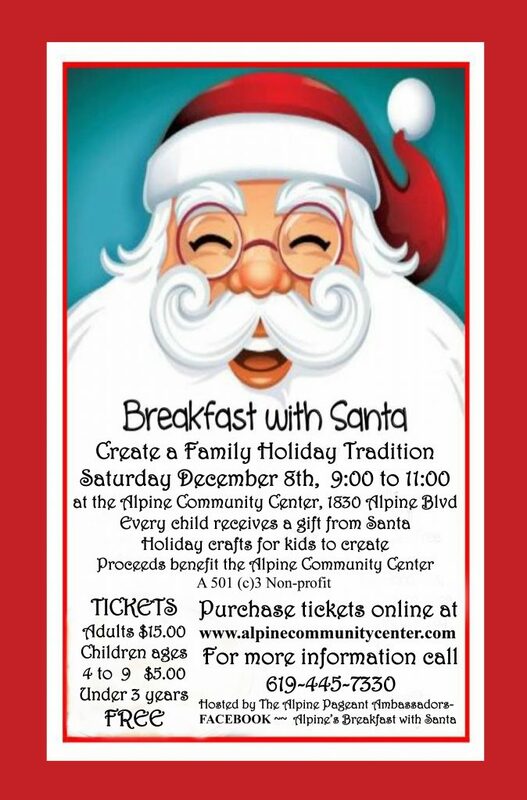 The Alpine Community Center Presents, BREAKFAST WITH SANTA – December 8, 2018 from 9am to 11am. Join us for a buffet style breakfast, and EVERY CHILD will receive a GIFT from SANTA! There will also be holiday crafts for the kids! 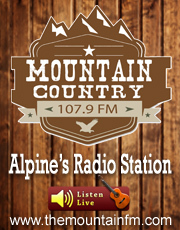 All Proceeds benefit the Alpine Community Center! The meal will be delivered between 9:30 & 11am and there is no charge. 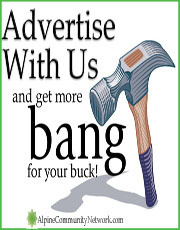 We will only be delivering to the Alpine area. A traditional Thanksgiving meal will be delivered. *WANT TO HELP? Albertsons is stepping up this year with the Turkey Bucks campaign! You can contribute directly to the Albertsons Turkey Bucks program; all proceeds will go to local residents!!!! 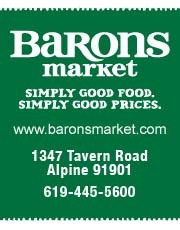 Money collected in their store will go locally to our Thanksgiving dinner, and they will receive an Alberstons meal..!!! woo hoo Albertsons! Men’s Tuesday Night Softball at The Alpine Community Center are accepting teams! 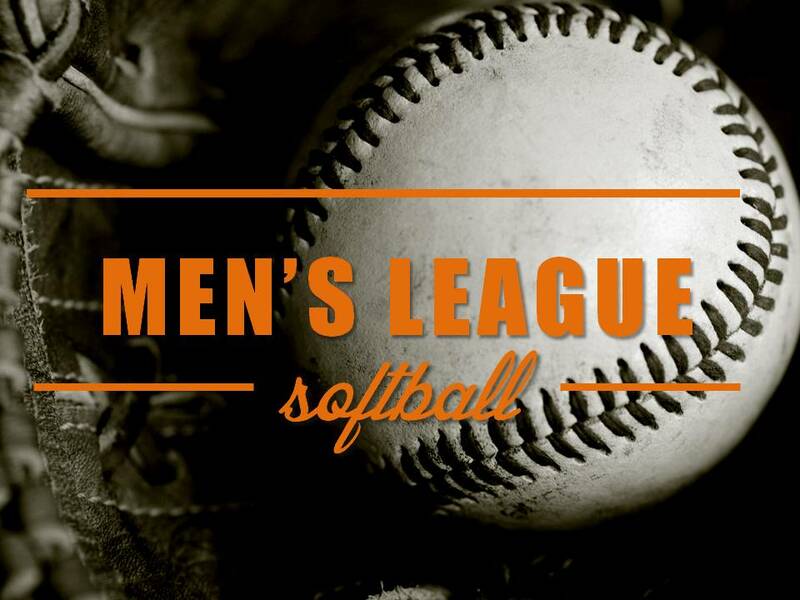 October 2018 – Men’s Tuesday Night Softball at The Alpine Community Center are accepting teams! 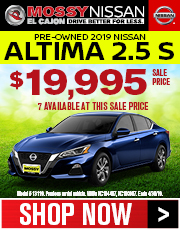 Deadline: Friday Nov 2, 2018 at 9 a.m. 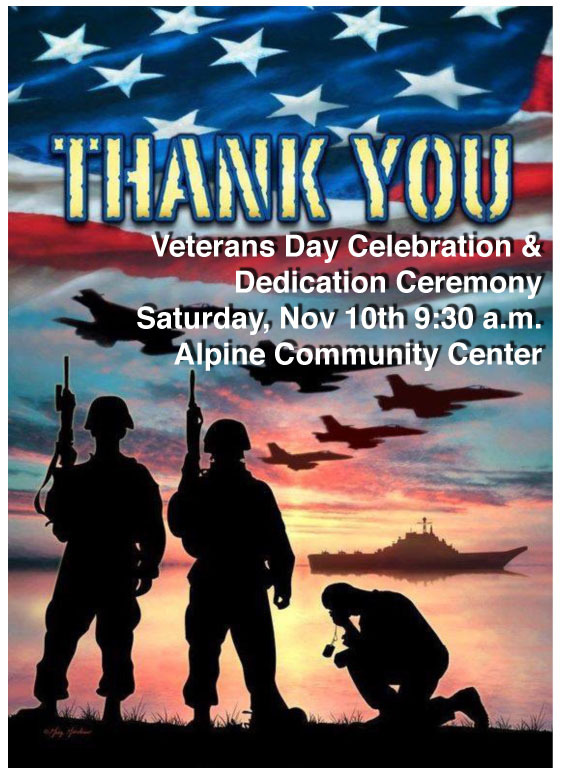 Contact the Alpine Community Center at 619.445.7330 or crobertson@alpinecommunitycenter.com for more details! 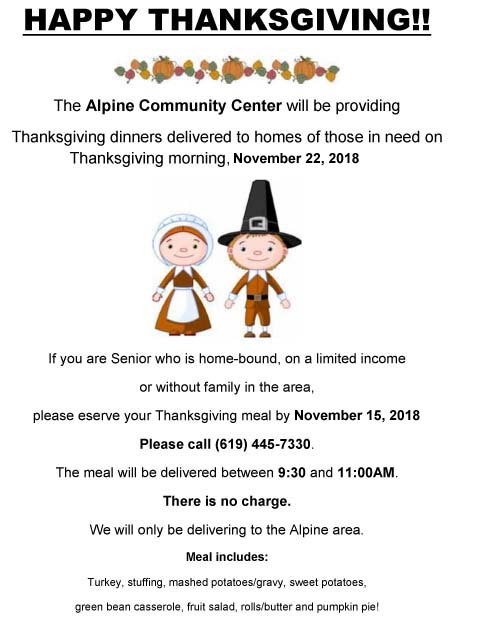 The Alpine Community Center has been serving Thanksgiving meals to local seniors for 21 years! In the past we have had financial support from Aging and Independence Services; that help no longer exists. 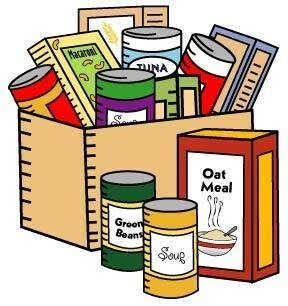 The purpose of this letter is to ask our community for assistance to feed those in need right here in Alpine. 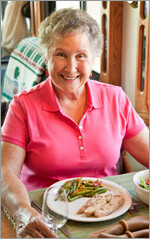 We have a team of volunteers who assemble the meals and deliver them to the homes of seniors. The meal consists of: turkey, mashed potatoes, gravy, dressing, green bean casserole, fruit salad, sweet potatoes and pumpkin pie. 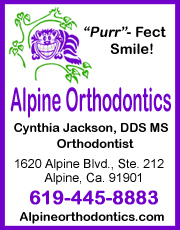 We also put together “goodie” bags which contain tokens from our local Alpine businesses. Please help us with a donation to support his program! We can use monetary donations, and/or things to go in our goodie bags. 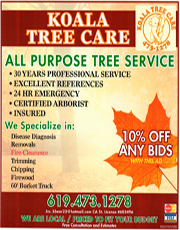 Your donation is tax deductible and we will provide you with a tax receipt. 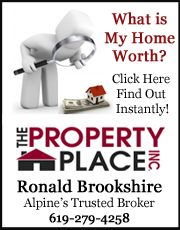 The senior citizens of Alpine will benefit greatly and will be very appreciative. 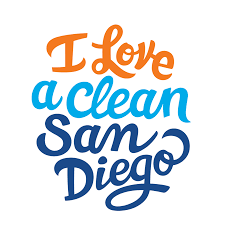 At all of our community cleanups we provide cleanup supplies, educational exhibits, and water. We also provide community service hours and Letters of Appreciation for volunteers. 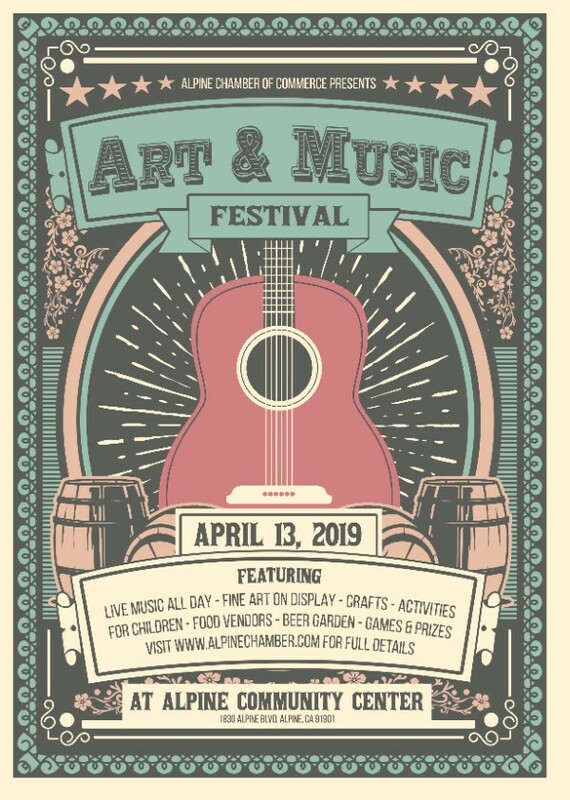 This is a great opportunity for students, scouts, corporate teams, congregations, families, and everyone else under the sun to help clean the community. If you are interested, come out and give it a try – you won’t regret protecting our natural environment with like-minded people by your side!